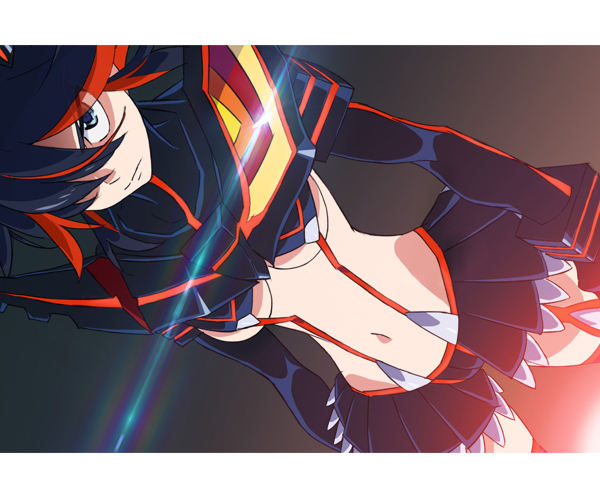 Kill la Kill is an anime television series produced by Trigger. It follows vagrant schoolgirl Ryuko Matoi on her search for her father's killer, which brings her into violent conflict with Satsuki Kiryuin, the iron-fisted student council president of Honnouji Academy, and her mother's fashion empire. The series is Trigger's first original television anime project. It aired in Japan between October 3, 2013 and March 27, 2014. Aniplex of America licensed the anime for a simulcast, with a home video release starting July 2014. The series premiered on Adult Swim's Toonami block on February 8, 2015. A manga adaptation by Ryō Akizuki began serialization in Kadokawa Shoten's Young Ace magazine from October 4, 2013. An OVA was released as a 25th episode on September 3, 2014. Lady Sandra Home Fashions Inc. has teamed up with Aniplex to create a collection of throws and cushions.